There is not much I can say about my poet friend Jennifer Lighty that wouldn't be revealed by reading her words below - she is deeply soulful, articulate, dedicated, and a brilliant wordsmith. I thank my lucky stars for being in her bright, celestial orbit. How do you define creativity? My hands in motion on this keyboard typing letters that signify sounds remembered in my body—that is creativity. And these letters that merge into words that my brain identifies with subjects seen, tasted, touched, smelled and heard, sounds I first heard when I floated in the dark inside my mother’s body. We invent stories to make sense out of chaos, or to praise it, depending on which archetypal deity calls to our souls. We create. (Eros, the Greek god of desire and creativity was the son of the goddess Chaos.) When we create we reach into the dark, the womb, into this mystery, and manifest what we receive in the physical world. Creativity is an everyday miracle like being born. The old dead tree rocked dangerously, and with one last groan fell to the ground. I remember being very pleased with it. I have no idea where it came from or what I felt like writing it, but I do remember afterwards that I knew I was a poet. I wanted to be a writer even before then, from the time before I could read. I wanted to read so badly I memorized books that my mother read aloud to me and pretended to read them as I turned the pages. How does a poem get birthed? Are there stages as with a human pregnancy and birth? For me, there is a masculine and feminine element involved in the creation of a poem. It’s a matter of becoming actively receptive, of being open to both what is in my immediate environment and what wants to come through me from other realms. Words feel so good when they rub together in certain ways! If I have an idea I want to convey without an image, I search for an image until I find one that feels right. It needs to be intelligible and pleasurable, by pleasurable I mean sound good. I do have to be careful of this though, I have such an attraction to beauty that I have sometimes done a disservice to my subjects by making them sound beautiful when they were not at all. In those cases it’s a matter of finding sounds that match the experience, ugly or harsh sounds, or playing with the punctuation or line break to break the rhythm up. I also pay attention to where silence wants to enter the poem. Sometimes these silences say even more than the words. I pay attention to all of these things—every word, line break, comma, period, italics, question mark—every mark on the page, in fact. I am getting better at hearing the line—where to break it so that it has the greatest emotional impact, because I have become better at hearing my own voice, and not the voices of all the other poets I’ve read or heard. You work is deeply connected to both the earth and spirit. Can you talk about walking between these worlds and what inspires you? It’s not a matter of walking between earth and spirit for me, they are the same world. I am definitely inspired by Earth’s beauty. I want to praise that beauty. I also want to lament what we have lost and are losing as you read these words. I also want to create a space for people to grieve their personal losses. 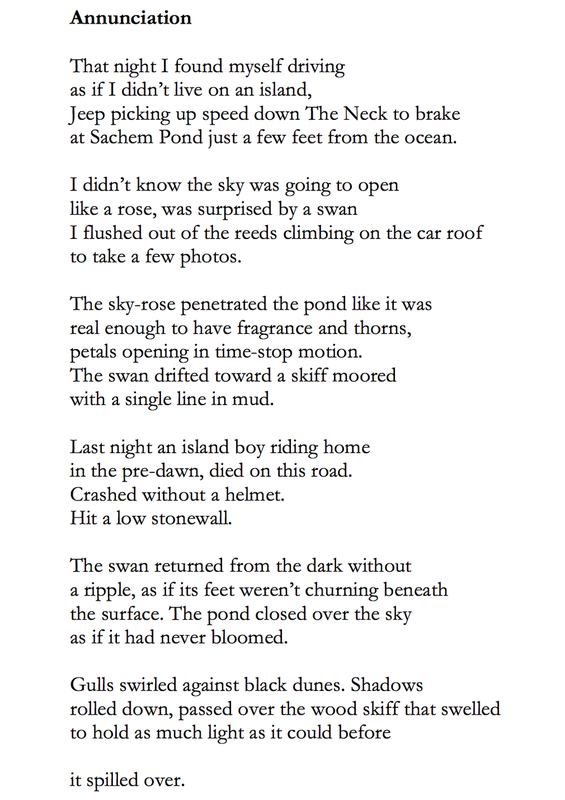 I wrote a poem about the Sandy Hook Elementary School shooting in Newtown in which the natural world acts as a mirror for the loss of those children and teachers. It takes place on the oyster farm where I was working the day of the shooting and everything I saw that day—egrets, crabs, mud, sun, shells—was so deeply infused with the symbolic the earth became a mirror of what had happened, and a prayer to the spirit world to help us get through such a terrible tragedy. You not only write poems, but also books, blog posts, and articles. How do you determine which form the words want to be? It’s a matter of listening and intention. Sometimes the two merge—those are the best times. With a blog post, I intend. If I’m lucky I may come up with some poetic words, too! The three novels I wrote probably could have been written as short stories or poems, saving me many years worth of labor—I was just really fixated on the idea of being a famous novelist so I kept trying. My articles and essays are lyrical, but are also attempts to convey information or a story. This is also possible in a poem by the way, sometimes I just prefer the art of the sentence over the art of the line. Poetry, the art of the line, is my greatest love because poetry has taught me to listen, not just to what I want to hear, but to what the Irish poet-hero Finn McCool learned to hear, “the music of what is.” When I listen to what is, I know what form the words want to be. What's the most exhilarating part of writing? The most exhilarating part of writing is when I enter into a state of being unaware of time. What's the most challenging part of writing? The most challenging is letting go of my preconceptions, fears, and desires and letting the words tell me what they want. I call it finding the poem within the poem. I think this is easier for a lot of other writers, but for me it takes a lot of digging. Part of this is because I have a fear of being exposed, so it’s difficult for me to be vulnerable, which has led to some dishonest moments in past poems. I still have those dishonest moments, but I am better at catching them and work through them now. I met the poet Ellen Bass this past winter. She writes with what I would call no filter about her personal life. I asked her what her relationship was like with her inner editor. Did she have to get past this editor to expose so much of herself? Her reply was enlightening and helpful—and humble. She replied that we’re all human and we’re all going through the same things. Those words helped me let go of a lot of ego and write more freely about myself, which ironically has helped me let go of the driving need to write about past personal traumas. I don’t need to be witnessed in the same way any more, I witnessed myself. My vision has turned outwards. Any daily or weekly habits and practices? I’m not good with routines, but I do write every day! I live in a stream of words and images that I try to write down as they occur. If I can’t give them my full attention at the moment, I tell them I will soon and ask them to please wait for me. I read all the time—poetry, fiction and non-fiction. And physical movement is an important part of my creative process—walking, dance, riding my bike, and yoga. Advice for aspiring writers? That’s hard. There’s something about figuring it out for yourself as a writer that is just so important. I have an incredible teacher, a man named Fran Quinn. When I first started working with him it took me two years to finish one poem! This was after writing poems for 15 years or so. I was going crazy thinking I was the worst poet in the world, completely doubting myself. Finally, I started to have breakthroughs where I would understand some simple thing that would help my poems come closer to completion, and I would say to him, “Why didn’t you just tell me that a year ago?” He always laughed, somewhat demonically and certainly with delight. He wanted me to understand it on my own because he knew then I would really understand it in my bones, the knowledge of where to break a line or when to use a four or three line stanza would come naturally to me because I had also learned how to set boundaries within myself. He was willing to be my guide in getting there, but I had to do the work. So that, if you could call it advice, is my advice. Do the work on all levels. Let your poems and novels and essays teach you about yourself. What do you need to change within in order to bring them into the world? If you listen deeply enough, if you are devoted and willing to work, they will not fail you. They want to be heard. Jennifer Lighty is a poet and teacher living on Block Island, RI. Her poems and essays have been published in many journals such as The Beloit Poetry Journal, The Island Review, The North American Review, and Poet Lore. She was recently nominated for a Pushcart Prize by the Beloit and for the Best New Poets 2014 anthology, and is the 2014 Merit Fellow in Poetry for the State of Rhode Island. Read more of her work and about her upcoming e-course developed to connect those on a creative path with earth-based spirituality on her website here.